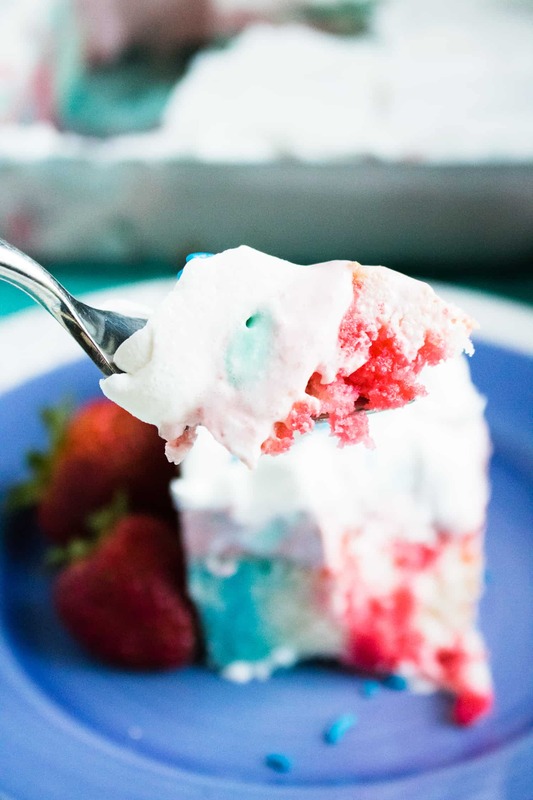 4th of July Poke Cake with Frozen Strawberry Layer is sure to be a hit at any Independence Day celebration. 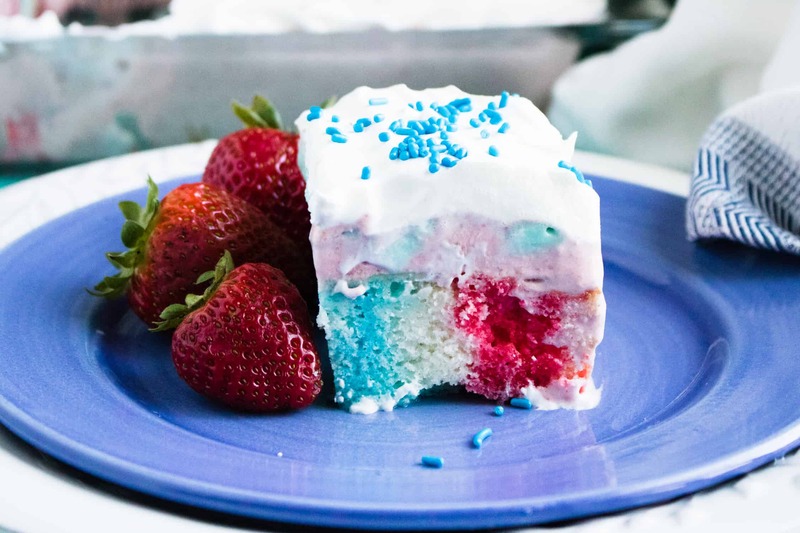 This fun and festive dessert is bursting with berry flavor and patriotic colors, thanks to gelatin-soaked, light and airy white cake. And, the addition of the unexpected frozen strawberry layer takes the traditional poke cake a step further with the combination of luscious strawberries, silky-smooth cream cheese, and red velvet pudding mix. Poke Cake was invented in 1969 by General Foods Corporation, as a way to increase sales of their flagship product, Jell-O. The original version is made by baking a white sheet cake, poking holes with a fork all over the top of the cake, and then pouring strawberry Jell-O all over the top of the cake, allowing it to fill the ‘poked’ holes. Bakers are now moving beyond gelatin and filling their poke cakes with everything from flavored syrups, chocolate, and salted caramel, to boozy cocktail mixers. If you love the poke cake concept, then you’ve got to try our Orange Creamsicle Poke Cake. It’s a fun spin on a summertime classic. For your next adults-only gathering, Boozy Pineapple Piña Colada Poke Cake recipe is like having your favorite delicious summer cocktail, served on a plate! 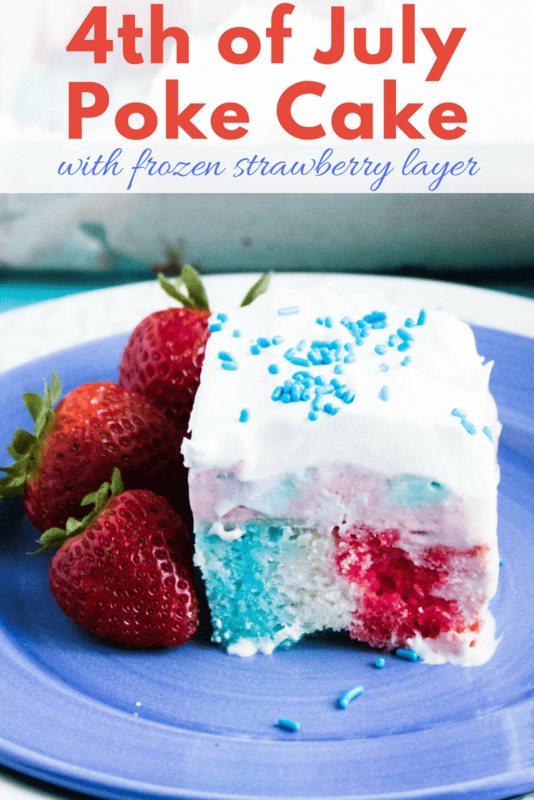 But when it’s time to celebrate your love for the Red, White & Blue, 4th of July Poke Cake with Frozen Strawberry Layer is the perfect sweet treat to take to any holiday barbecues, picnics, and pool parties. It’s a true All-American crowd-pleaser! Instead of using a spoon to make the red and blue gelatin rows, try this easy, no-spill option. Pour each of the prepared gelatin mixtures into a separate squeeze bottle. The perfect solution when the kids want to help out! Bake cake according to package instructions. Allow to cool. Using a fork, poke holes in the top of the cake. Mix together the blue and red gelatin each with 1 cup of boiling water until dissolved, and then spoon each color gelatin over the cake. Making sure to pour into the holes. First pour a row of blue, then a row of red, and keep alternating to get a colorful mix of red and blue in the cake. Spoon over each row 2-3 times for good coverage. 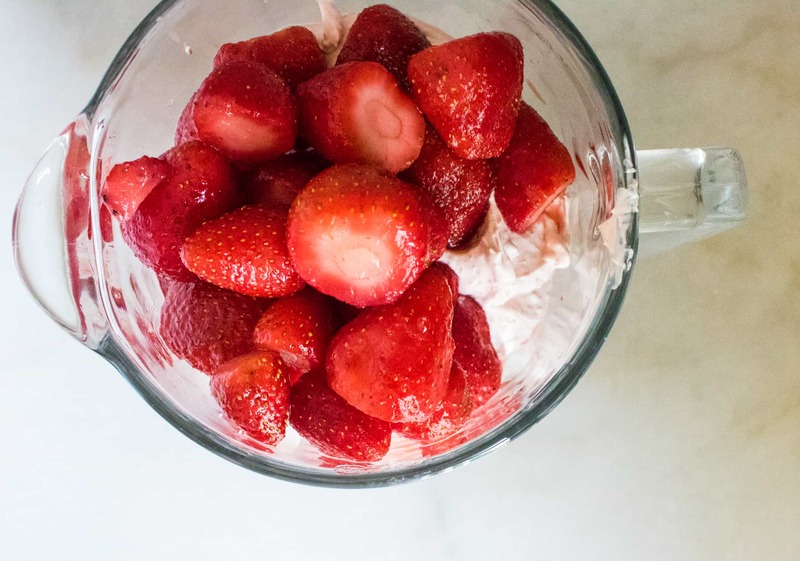 Next, in a blender or food processor, combine cream cheese, red velvet pudding mix, milk and frozen strawberries. Mix until smooth. Pour this layer over the top of the cake and then freeze for 4 hours, or overnight. Top with whipped cream and colorful sprinkles, then slice and serve. Enjoy! This fun and festive dessert is bursting with bright berry flavors and patriotic colors. Bake cake according to package instructions. Allow to cool. Using a fork, poke holes in the top of the cake. 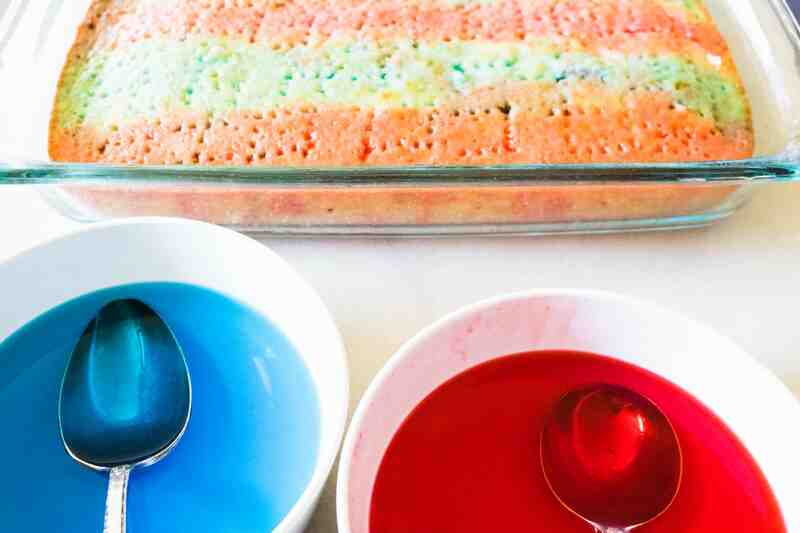 Mix together the blue and red gelatin each with 1 cup of boiling water until dissolved, and then spoon each color gelatin over the cake, making sure to pour over the holes. The best way to do this is a row of blue, then a row of red, alternating so you get a colorful mix of red and blue in the cake. Spoon over each row 2-3 times for good coverage. Next, in a blender or food processor mix together cream cheese, red velvet pudding mix, milk and frozen strawberries. Mix until smooth. Pour this layer over the top of the cake, and then freeze for 4 hours or overnight. Top with whipped cream and colorful sprinkles, slice and serve.